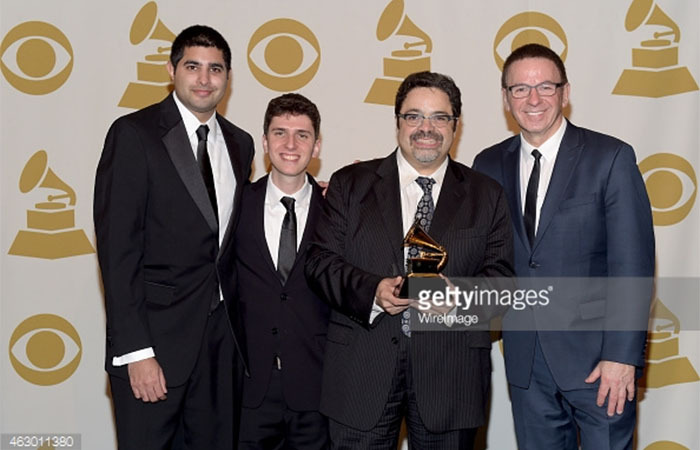 Harlem, NY — Tuesday, February 10, 2015 — The Afro Latin Jazz Alliance is thrilled to announce the GRAMMY® win for Arturo O’Farrill and the Afro Latin Jazz Orchestra’s latest album, The Offense of the Drum (Motéma Music: May 6, 2014), for “Best Latin Jazz Album”. 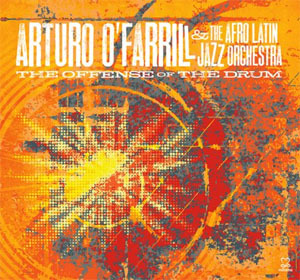 The Offense of the Drum is the fourth album from Arturo O’Farrill and the 18-piece Afro Latin Jazz Orchestra, expanding the definition of Latin jazz, with the drum taking center stage. Released May 6, 2014 on Motéma Music, it has garnered widespread critical praise, earning a Latin GRAMMY® nomination for “Best Latin Jazz Album” and being named one of NPR’s favorite albums of 2014. The album features guest artists Vijay Iyer, DJ Logic, Edmar Castañeda, Donald Harrison, Pablo Mayor, Miguel Blanco, Antonio Lizana, Jason Lindner, Christopher “Chilo” Cajigas, and more. The non-profit Afro Latin Jazz Alliance (ALJA) was established by Arturo O’Farrill in 2007 to promote Afro Latin Jazz through a comprehensive array of performances, educational programs, recordings and international cultural diplomacy initiatives. ALJA self produces the Orchestra’s annual performance season at Symphony Space (2007 – 2014), and maintains a weekly engagement for the Orchestra at the famed jazz club Birdland. The Alliance also maintains a world-class collection of Latin Jazz musical scores and recordings. ALJA’s education initiatives include the Afro Latin Jazz Academy of Music in-school residency program serving public schools citywide with instrumental and ensemble instruction, and the pre-professional youth orchestra, the Fat Afro Latin Jazz Cats, which prepares the next generation of musicians. The Afro Latin Jazz Alliance is a partner project of the Fund for the City of New York and maintains an administrative office at the Harlem School of the Arts — The Herb Alpert Center where O’Farrill and the Afro Latin Jazz Orchestra are currently artists-in-residence. Arturo O’Farrill’s debut album with the Orchestra, Una Noche Inolvidable, earned a GRAMMY® Award nomination in 2006 and the Orchestra’s second album, Song for Chico, (ZOHO) earned a GRAMMY® Award for “Best Latin Jazz Album” in 2009. In February 2011, Mr. O’Farrill and the ALJO released their third GRAMMY® nominated album, 40 Acres and a Burro (ZOHO). In 2011, O’Farrill released his first solo album, The Noguchi Sessions, (ZOHO). On May 6, 2014, O’Farrill and the Afro Latin Jazz Orchestra released their latest album, The Offense of the Drum, on Motéma Music. Chico O’Farrill Afro Cuban Jazz Orchestra’s Final Night at Birdland (Zoho) won the 2014 Latin GRAMMY® Award for “Best Instrumental Album”. For more information on the Afro Latin Jazz Alliance, please visit www.afrolatinjazz.org. *Images from the The 57th Annual GRAMMY® Awards at the STAPLES Center in Los Angeles on Sunday, February 8, 2015.